Please do not ask me to resize the quilts here on my site. I don’t have time! I only offer free instructions for the quilts I make or plan to make. Please note: These instructions were UPDATED on Feb 19, 2011 and if you downloaded them prior to that, a clear explanation for cutting the border half rectangle blocks was not included as you need both regular and reversed triangles when working with rectangles. Both the pink and brown estimates assume that the borders are pieced. PLEASE NOTE – these are untested estimates and are provided only as a guide. I’d suggest having extra on hand especially if using the Accuquilt GO to cut your blocks. I can’t believe people asking for this to be resized. This is the 3rd line down on the top of the page!!! Anyone who can’t figure out how to enlarge or decrease a pattern probably should not be trying a pattern that doesn’t meet there needs in its original form. I have only been quilting for 3 years but that is the 1st thing I learned when I started quilting. It seems to me anyone even someone with minimal experience can enlarge or reduce the size of the quilt by adding or deducting inches equally to the cutting instructions. Just a quick question, my quilt guild, Great Lakes African American Quilters’ Network, is planning a quilt show this fall. Each member is allowed an opportunity to place a photo of themselves and some of their work in a souvenir book. I would like to include a photo of my carpenter star quilt. I need to know if there are any copyrights issues with this inclusion. Our books will be for sale. We are not including any patterns or directions. We are including acknowledgement of the sources of our work, I.e. Designer, pattern name, materials. Etc. Please let me know if there are any special permissions I need or if this isn’t allowed. Thank you. 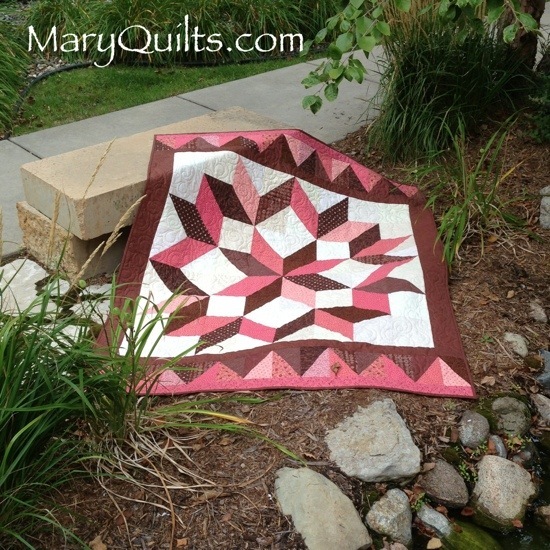 Did you custom quilt the Carpenters Star or that an edge to edge I’m seeing? I’ve got to figure out what to do with mine. Thank you for the pdf. I have seen this quilt many times and always wished for a pattern. I need in bigger, but will add another border. It will grace a derserving veteran at some time. Your instructions are very clear. do you have instructions for the top and bottom border pls? Thanks so much for the free pattern, I really appreciate it.